The next Workshop will be held Sunday, April 7, 2019 from 2 p.m. to 5 p.m. There will also be an Easter Bazaar and buffet luncheon at the Shrine that same day. 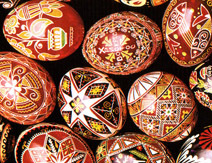 Learn to decorate Easter Eggs the traditional Ukrainian way. Detailed A/V presentation, personalized instruction, materials & supplies included. For additional information, please see the Workshop and Bazaar Flyer. The fee for the Workshop is $20 for adults or $12 for children under age 12. We're sorry, but the 2019 Workshop is full; registration for the Workshop is closed. The annual Pysanka Workshop for beginners and advanced students is regularly scheduled only once a year on the Sunday preceding Palm Sunday. If you have enjoyed the workshop, share the joy of making pysanky with your friends and family. Authentic pysanky, pysanka-decorating kits and other supplies may be purchased during the workshop and year–round at the Shrine Gift Shop. For further information, please e-mail to Jurij Dobczansky.